Another release for the 10th Anniversary of the Big Bang is a watch that goes ding-ding. It isn’t a minute repeater. 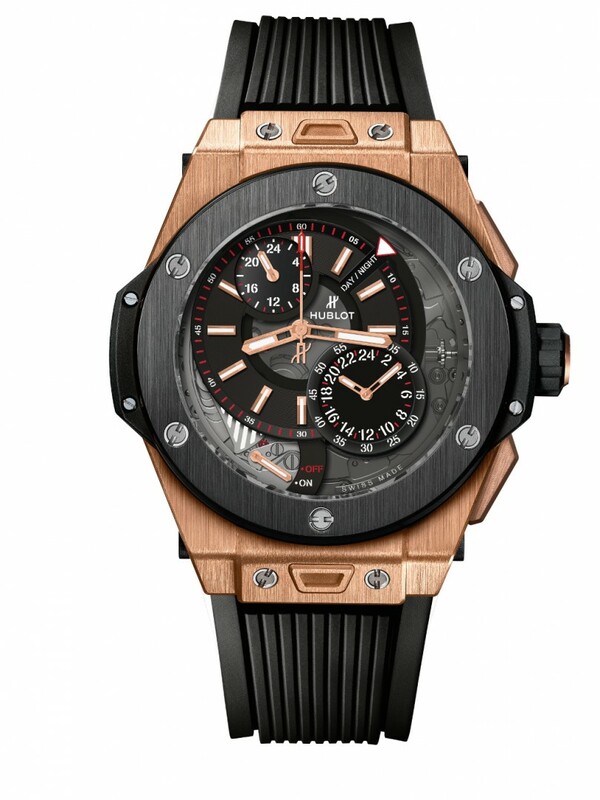 Introducing the Hublot Big Bang Alarm Repeater. The case of the watch measures 45.5 mm in diameter. The look of this piece distinguishes it from the chronograph versions: the push-button at 2 o’clock is used to adjust the time of the second time zone, while the push-button at 4 o’clock activates the alarm. All the other functions are easily operated using the crown. The alarm clock – a complication which belongs to the chiming clock category – is indexed on the reference time. At 1 o’clock, a triangular window gradually shows the day/night indicator for the local time. At 5 o’clock, a 24-hour counter with two hands shows the programmed alarm time; while an “on-off” indicator shows the alarm status at 6 o’clock. At 7 o’clock, the hammer visible under the sapphire is coated with SuperLuminova™ so it can be seen at night. The second time zone has a 24-hour display at 11 o’clock. The alarm clock chimes for around 16 seconds as a steel hammer strikes a gong. The HUB 5003 calibre comprises of 356 components, a 72-hour power reserve and two barrels – one for the movement, the other for the chime. The alarm clock’s power reserve indicator can be consulted via its skeleton barrel which reveals the spring. The watch will be available in titanium or King Gold. Each version will be limited to 250 pieces each. Both versions are paired with a structured and ribbed natural rubber strap featuring an ingenious “One click” system for changing the strap.